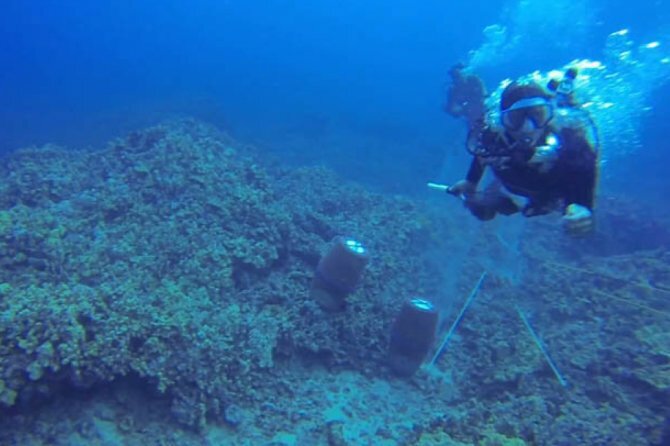 In an extraordinary video capture, a fish collector in Hawaii has been filmed attacking Rene Umberger, a photographer for the Sea Shepherd conservation society, writes Nathan Hill. The attack, which could have easily proven fatal, has renewed discussion and rhetoric between anti-industry conservationists and those who are pro-hobby, pro-trade and pro-collection of wild marine livestock (scroll down for video). Unfortunately, this discussion is now running the risk of derailing as people become increasingly heated in their sentiments. More time seems to be spent bandying emotions than reason, and this needs to stop. I want to suggest we bring things back into a moderate position again — assuming that an attempt on someone’s life can ever be dealt with moderately. Mud flinging has been rife, and quite shamefully neither side has behaved impeccably. There has been contention between the aquarium industry and Sea Shepherd for some time. This is pretty much unavoidable, as Sea Shepherd holds the position that collection of wild fish is unsustainable and should be halted with immediate effect. That’s not exactly conducive to a thriving aquarium industry. By coincidence, it was just this week that Sea Shepherd launched 'Operation Reef Defence' in Hawaii. The aim of this, as Sea Shepherd point out on their website is to "end the destruction of coral reefs and the many threats they are facing worldwide." Well, I don’t think anyone can really argue with that particular, noble goal. Sea Shepherd go on to point out in their mission statement that: "30 percent of the world’s coral reef population has died in the last 50 years. Another 30 percent has suffered severe damage, and 60 percent could die in less than 25 years because of human-induced activities such as pollution, overfishing, reef wildlife trafficking, coastal development and global warming." This raises some questions, and seems a tad myopic. In Sea Shepherd’s defence, if these claims are all true, and can all be heaped at the door of aquarists, then we have an awful lot to answer for. The problem for Sea Shepherd, however, is demonstrating exactly how these figures were attained, and exactly how hobbyists and the aquarium trade are responsible. And heaping these woes on aquarists’ doors, Sea Shepherd are quite explicit about. They make the very clear statement that: "Massive reef wildlife dies every year as disposable ornamentation in the vicious cycle of wildlife trafficking for the pet trade." Note the use of emotive words here, and the very specific begging of the question — that is to say assuming one of the very points under contention. The word that jumps out at me straight away is 'trafficking'. In the sense used here, to 'traffic' means quite specifically to trade or deal in something that is illegal. Welcome to the first stumbling block. Hobbyists aren’t interested in trafficking fish. We want no truck with an illegal collection racket for livestock. In that, I think we would all get behind Sea Shepherd and say that we want the illegitimate, unregulated and illegal harvesting of livestock for any purpose to stop. But we’d politely ask that we don’t get tarred with the same brush. That’s a serious allegation. That said, if there is substance to this allegation, then I want to know more. If there’s an illegal element feeding the trade, operating out of sight and with impunity, then I’ll happily join Sea Shepherd in exposing it. But I’m confident that the mainstay of our trade is all above board. I’m somewhat affronted by this unqualified label that tries to assert that responsible aquarists are somehow implicit in illegal trading. Sea Shepherd go on to say that: "Death generates continuing demand, driving the aquarium trade to strip reefs bare. 25 million creatures are in the commercial aquarium pipeline at any given moment. Nearly all will die within a year from the point of capture." Woah there, Sea Shepherd. Death causes people to leave the hobby, eventually killing it. Nobody wants ornamental fish to die (to my knowledge), as this makes no commercial sense at all. I also notice the subtle moving of the goalposts here, tangling 'trafficking' from before, with 'aquarium trade' now. The two are not synonymous, and I openly accuse Sea Shepherd of attempting the most egregious casuistry. Even despite this tacky wordplay, the figures don’t appear to be on Sea Shepherd’s side anyway. Robert Wintner, Sea Shepherd’s Vice-president and something of a walking hashtag for the society, has been repeatedly asked to cite reference to the figures he bandies so damningly. To my knowledge, so far, none have been forthcoming. This is more than I can hope to cover here, and I confess to being absent of some of the contacts I’d need to pursue it (as Sea Shepherd seems primarily geared against the American market instead of the UK one). I’m aware that American journalist Ret Talbot has written quite comprehensively on the subject of Sea Shepherd and Robert Wintner, and I recommend a look at his blog on the subject for a wider overview. But none of this warrants an attack on a diver. What has been damning from our side of the fence is that some folks have — perhaps in the heat of the moment — made the vilest remarks. "Next time, pull of the mask AND the regulator…" was one such sentiment I came across, and there are many more like it. Well, shame on us if that’s the position we’re going to take. I don’t care how opposed to someone’s opinion you are, or how much offence you might take from their actions, to wish them harm is abhorrent. We as a collective industry should be above this, as I know the majority of us are. It remains that if we’re not prepared to listen to the arguments against our position, we become a dead dogma. Even if the whole world were in agreement about the current state of the aquarium trade, with just one, single dissident, then it is just as vital that we hear that noncomformist voice out. I’m sure there is much more to the story of the attacked diver than is being let on, but all we can do is speculate. Perhaps there was a campaign of relentless harassment against this one antagonised diver until his or her resolve snapped. Though if I’m going to propose that, I should at least posit an alternative suggestion: perhaps those were illegal fishermen of the exact kind Sea Shepherd highlights. Perhaps this was trafficking of fish, plain and simple. We do not know. But to wish harm to the victim on the basis of her views is repugnant, and I’d like to think that anyone reading this will join me in wishing Rene Umberger a speedy recovery from any shock endured from the assault. I also invite both sides of this debate to engage in sensible discussion without the need for hostility. But as a closing remark, I would have to state that I have tried to contact Sea Shepherd on several occasions now, and have not once been graced with a response. I’ll let you make of that what you will, because I’m more than comfortable arguing for my side of the pro-trade position with any of their representatives.